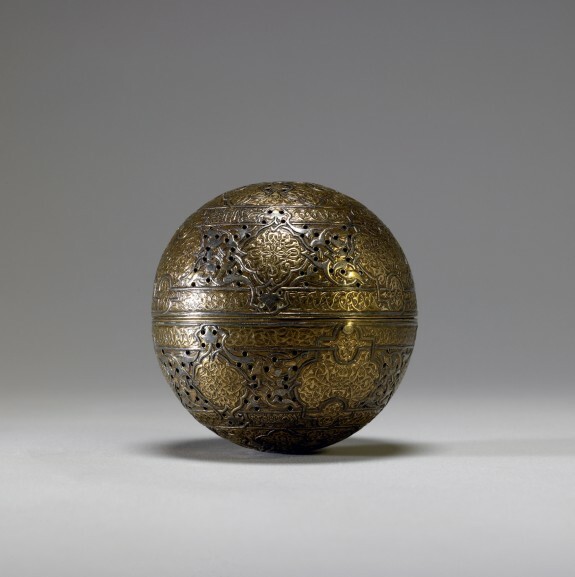 Pierced globe Incense Burner, Mamluk period (1250–1517), late 13th–early 14th century. Syria, Damascus. British Museum. Zayn al-Din. Incense Burner or Handwarmer. 15th – 16th c. gilded brass with silver inlay. Walters Art Museum. Knowing my interests, my friend and remarkable scholar, Dr. Stephennie Mulder sent me the image of the gimbaled censer above. 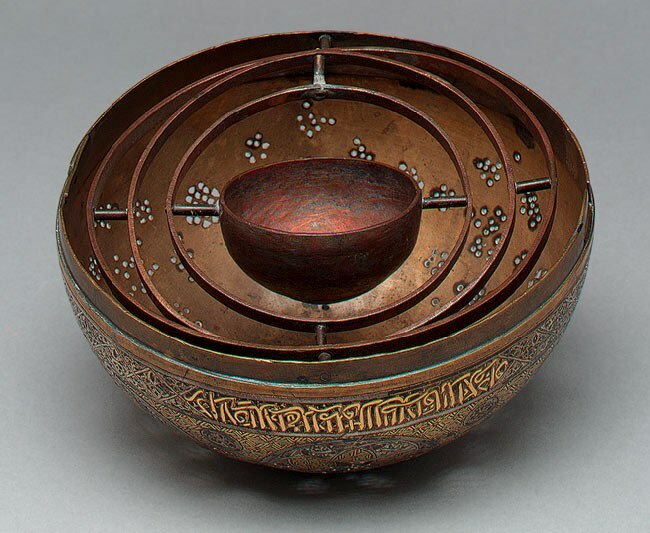 The link to the British Museum (which seems to be dead now) stated that the gimbals keep the incense cup from spilling its contents while swinging but this seems overly fussy to me considering the centrifugal forces of swinging itself solve that problem. Another site suggested that these type of censers were used in games and rolled from one guest to another. I suppose this would work if it were a very low impact game but any amount of velocity or impact and I think the host’s carpet would suffer some damage from errant embers. The description of “hand warmer” makes a lot more sense to me. In this case the mechanism would function perfectly. Unfortunately, I can’t confirm that the Walters object is also gimbaled though it must have some kind of suspension for without it the orb would certainly be too hot handle with bare hands. All these pragmatic issues aside, both of these objects are virtuosic expressions of master metal smiths and are a delight to they eyes. What a pleasure it would also be to hold one of these in my hands!